The Leicester Mela comes to the city centre this Bank Holiday Monday where spectators can enjoy a whole host of South Asian arts and cultural activities throughout the city centre and experience live entertainment on the main stage. There will also be delicious cuisine from across the Indian subcontinent to enjoy. The Spalding & South Holland festival is back this weekend with almost 50 food and drinks stalls, live entertainment and a fun fair. "South Holland in Lincolnshire produces and or processes over 40% of the nation's food, therefore it's not surprising that Spalding intends that their food festival should be an annual key Lincolnshire event. It aims to promote local food producers and to draw visitors to the town... it should be an excellent 'foodie' feast"
Alexanders Horseboxes Scope Festival Supreme Championships 2015 is one of the most prestigious events in the Show jumping calendar. 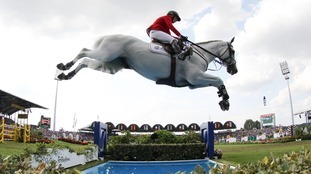 The most prolific showjumpers from around the world will compete at the event at Staffordshire show ground this weekend. Entry is free until 5.30pm. Street performers will be at Hippodrome Square and Arcadian in Birmingham over the weekend as comedians, circus and dance performances line the streets entertaining visitors at the city's Summer in Southside event. This weekend marks the start of the 10th annual music and arts festival which continues until September. On Sunday, Bridgnorth High street will be closed off and in its place, up and coming artists will perform on the main stage. The town's annual food fair and Blondie’s vintage market are also being held over the Bank Holiday weekend. "We’re thrilled to reach this fantastic milestone, our tenth festival in 2015, from August 28th until September 6th. We’re back with more great music, art, photography, poetry, film and much more all around the district for ten days." The best folk acts from around the world will descend on Shrewsbury for the annual Folk Festival this weekend. The four-day event is a blend of traditional folk music, dance and cultural diversity. As well as music on the big stage, there’ll be events and entertainment for all to enjoy including dance displays, open mic, a craft fair, children’s festival, food village and music and dance sessions. “We bring a world class music event to our amazing riverside location in the heart of Shrewsbury. The beauty of our festival is that it has something for everyone - whether you’re a die hard folk fan or just looking for a great event to enjoy."